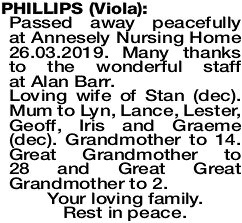 Passed away peacefully at Annesely Nursing Home 26.03.2019. Many thanks to the wonderful staff at Alan Barr. Loving wife of Stan (dec). Mum to Lyn, Lance, Lester, Geoff, Iris and Graeme (dec). Grandmother to 14. Great Grandmother to 28 and Great Great Grandmother to 2. Your loving family. Rest in peace.